Now that The Walking Dead has staggered off for its customary six-month between-seasons break, broadcasters last night may have hoped to regain some of their lost potency in the Sunday 9 p.m. time slot. According to Nielsen live-plus-same-day data, the three regularly scheduled broadcast series that had previously gone head-to-head with AMC’s zombie apocalypse drama were either down or flat versus last week. On ABC, the supernatural drama Resurrection averaged 8.05 million viewers and a series-low 2.2 in the dollar demo, down 8 percent from a week ago. Fox’s Cosmos: A Spacetime Odyssey was flat with a 1.5 rating, while NBC’s midseason drama Believe continued to drop, notching a series-low 1.0 in the demo. Instead of a new episode of The Good Wife, CBS at 9 p.m. aired the second hour of the 49th Academy of Country Music Awards. The middle third of the broadcast delivered 14.7 million viewers and a 3.6 rating, doubling the 1.8 rating served up by last week’s installment of The Good Wife. While TV’s top-rated scripted show is on hiatus, the premium and ad-supported cable networks helped keep the time slot hopping last night, as HBO unveiled Season 4 of Game of Thrones, Showtime wrapped the fourth season of Shameless, and AMC took the wraps off its latest original drama, Turn. Although ratings for the aforementioned shows won’t be available until later today, last year’s Game of Thrones premiere averaged 4.37 million viewers and a 2.4 in the demo, while the Season 3 Shameless finale drew 1.82 million viewers and a 0.9 rating. UPDATE: Looks like Game of Thrones may have done some damage. The season opener averaged 6.64 million viewers and a 3.6 in the demo, making it the most-watched episode in the series’ history and HBO’s biggest single telecast since the June 10, 2007 finale of The Sopranos (11.9 million). 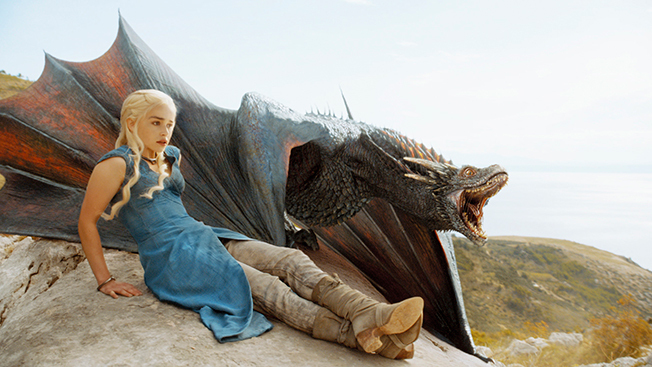 Thrones was the single highest-rated show on television Sunday night. Shameless also notched a personal best, delivering 1.93 million viewers and a 0.9 rating, which now stands as its biggest finale number. Last night’s installment was the third most-watched episode of Shameless, trailing the Season 3 premiere (2 million viewers) and Episode 27 (1.99 million). For its part, AMC’s Turn bowed to 2.12 million viewers and a 0.5 rating. AMC’s most recent launch, the one-and-done cop drama Low Winter Sun, bowed Aug. 11, 2013 to 2.51 million viewers and a 1.1 rating. While not nearly as crowded as the previous hour, the 10 p.m. slot also took a hit, as NBC’s Crisis slumped to a series-low 1.0, while ABC’s Revenge tied its nadir with a 1.3 in the demo. The final hour of CBS’ CMA coverage averaged a 3.5, down nearly a quarter from last year’s show. In the final hour of Sunday prime, HBO bowed the Mike Judge satire Silicon Valley and returned Armando Iannucci’s lacerating Beltway comedy, Veep, for its third season. Showtime countered with the House of Lies season finale. Silicon Valley put up decent numbers out of its Game of Thrones lead-in, averaging 1.98 million viewers and a 1.1 rating. Veep, however, slumped (960,000 viewers/0.5).